*Elasticated waist polyester pants for comfortable wear. Cigar not included, wig and moustache set sold separately. This Addams Family Gomez Costume is inspired by the rich and romantic man from the brilliant Addams Family series. 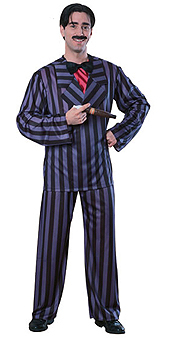 With his iconic purple and black stripe suit included, this is a perfect foundation for any Gomez Costume. So dance the night away with your love, Morticia, and don't forget to maintain that excellent moustache of yours.